I'm recently back from a two-and-a-bit week holiday in Peru and before we went the wife and I invested in new cameras to catalogue our adventures. As our cameras are both enthusiast/semi-pro level you have the option of shooting in RAW format to take advantage of greater post processing capabilities however the huge file sizes involved can be a real problem. Both our cameras use SDHC cards and we bought four with pretty high capacity coupled with good performance. Even these large cards didn't leave us with much room for two week's worth of photos and we really wanted to be able to easily back up photos while we were away should we lose a card or if it got corrupted. On previous holidays we took a portable hard disk with built-in card reader which worked really well however you don't seem to be able to buy these any more. I'm guessing, these days, with more portable PC options like netbooks or ultrabooks a lot of people use those to back up so demand for an alternative has dropped. An iPad with a decent size internal storage and a lightning to SD adapter would also be an option. We didn't want to buy a small laptop just for backup purposes as netbooks are still quite expensive and we were looking for a cheaper option, preferably that made use of my Nexus 10 Android tablet. 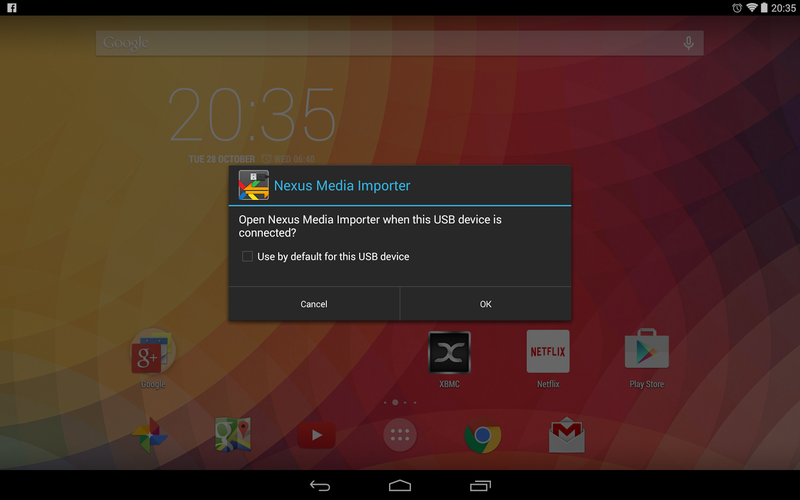 The Nexus 10 has a micro USB port which you use for charging the device but when you plug in an OTG (on-the-go) cable it gives you a full size USB port into which you can plug many different types of USB device and the Nexus 10 will host them and use their capabilities. For example, plugging in a USB keyboard will allow you to input text as you would on a full PC. Plugging in a USB hub allows you to connect multiple devices at the same time as with any other PC. 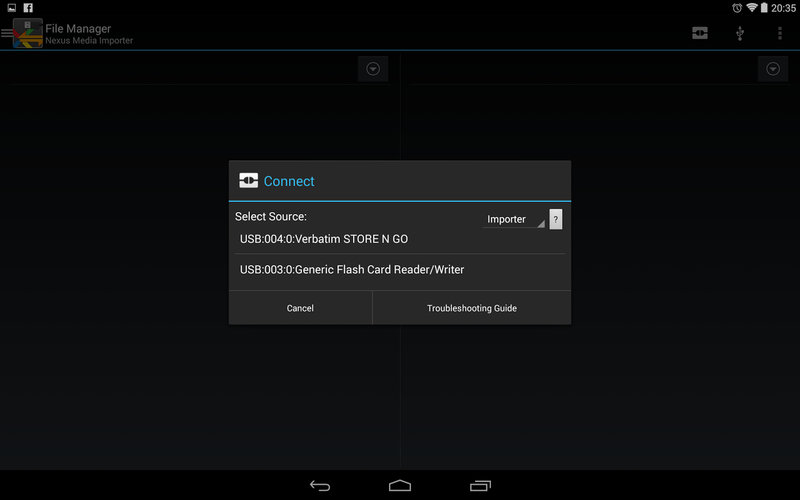 Lots of other Android tablets have a micro USB port and will work in the same way, not just the Nexus devices. This hub and card reader have the advantage that they’re both about 2” square so they form quite a compact unit and you could, for example, wrap an elastic band around them to keep them together. We took a small (3" x 5" x 2") tupperware-style box and, tablet excluded, all this fitted along with a couple of spare camera batteries and SDHC cards. 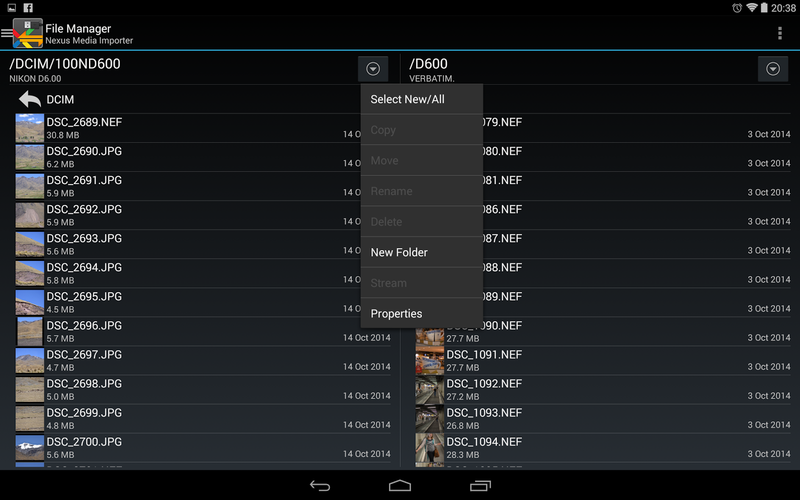 The other piece of the puzzle to get it all working is the Nexus Media Importer app. 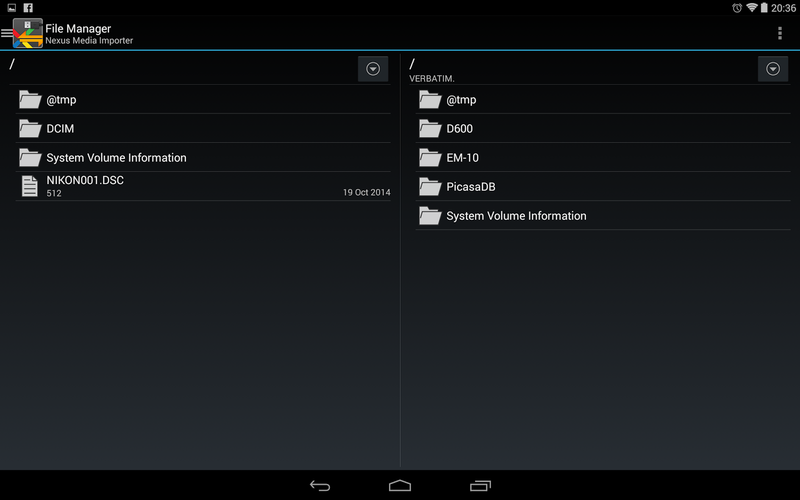 Ignore the "Nexus" in the name, this app should work with any "Android 4.0+ devices with USB Host support". The app supports a variety of different media files (photos, video, audio) and allows you to preview files as well as perform file management (move, copy, delete, etc) operations. Usefully the app (or Android itself) has native support for all the major RAW file formats so regardless of what make of camera you have you should be able to preview your photos right in the app. Note that, if you're using a USB hard disk you'll probably need a powered USB hub unless the hard disk has its own power supply. This is fine if you want to copy your photos onto the devices internal storage but we want to copy from one external storage (the SDHC card) onto another external device (the USB pen drive) and to do that we switch into the app's "Advanced" mode by selecting it in the drop down on the right that currently says "Importer". Here we select our source and destination respectively and the app then switches to a view showing you the source file system on the left and the destination on the right. Navigating to the correct folder is somewhat counter-intuitive at first as you have to tap the folder name to go into that folder, tapping on the folder icon to its left selects the folder meaning you can copy entire folders quite easily. Once you've found the right folder e.g. the folder your camera saves photos to on the left and the place you're backing up those photos to on the right the app has a great feature allowing you to select any new photos and only copy those. Once you've made a selection the other options such as "Copy" and "Move" become available in the menu and you pick the one you want. Selecting one and you'll get a prompt about the action you're about to perform - hit OK and the transfer begins. The file transfer goes on in the background meaning you can swap to a different app while the transfer is happening or even put the tablet into standby to save power. Assuming the read and write speeds of the memory cards and memory sticks you're using is good the transfers shouldn't take too long - the Transcend SDHC cards we bought had 90MB/s read speeds which made backup nice and quick. We made two backups of our photos onto the two USB sticks, my wife kept one and I kept the other and then we just formatted and reused our SDHC cards as required. All in all, was a fairly low cost and space and weight efficient solution I was really happy with and will be using on subsequent trips.